Crohn's disease is a condition that causes inflammation of the wall of the gut. Any part of the gut can be affected. This can lead to various symptoms (detailed below). Symptoms vary, depending on the part of the gut affected and the severity of the condition. The disease flares up from time to time. Crohn's disease is named after Dr Crohn, the person who first described the disease in the 1930s. If the colon is affected, there may be rectal bleeding or blood in the diarrhoea.The condition tends to get better or worse sporadically. Crohn's disease involving all or most of the colon for several years increases a person's risk of bowel cancer. 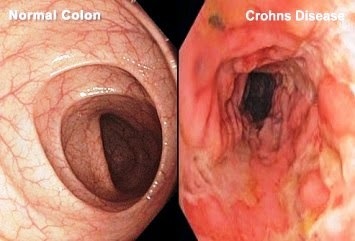 Those with Crohn's may also have ankylosing spondylitis, eye disorders (uveitis), kidney stones and erythema nodosum. Between one in 1,000 and one in 1,500 people have Crohn's disease in the UK. The symptoms usually first appear between the ages of 15 and 40. In Europe and North America, it most commonly affects Caucasians, particularly those of Jewish descent. The precise cause of Crohn's is unknown. The condition can run in families and is three times more common in smokers. Not smoking may reduce the risk of developing the disease. What's The Treatment Of Crohn's Disease? Treatments include anti-diarrhoea medication and painkillers, and medication (for example, corticosteroids) to reduce inflammation during attacks. Medication to suppress the immune system may be recommended to prevent recurrent attacks and antibiotics may be prescribed to treat infections. Dietary supplements can be given to counteract malabsorption. Surgery may be necessary to remove diseased areas of the gut.